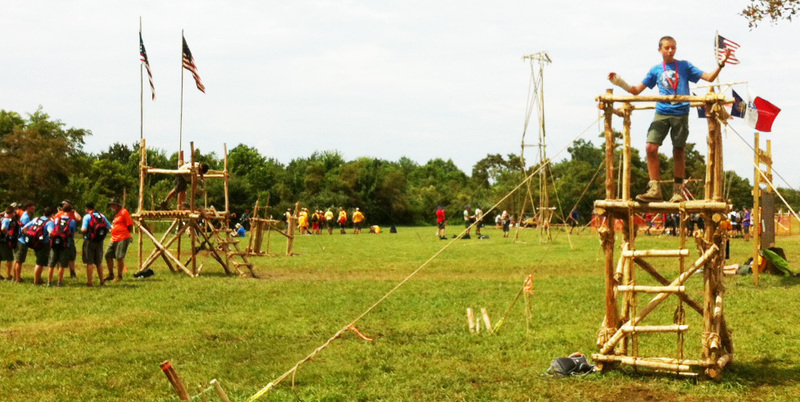 Three signal towers (14′ Double Ladder, Hourglass, and Stilt Tower) were presented in what was referred to as “Tower Town” in the pioneering area up on Garden Ground Mountain during the 2013 national jamboree. 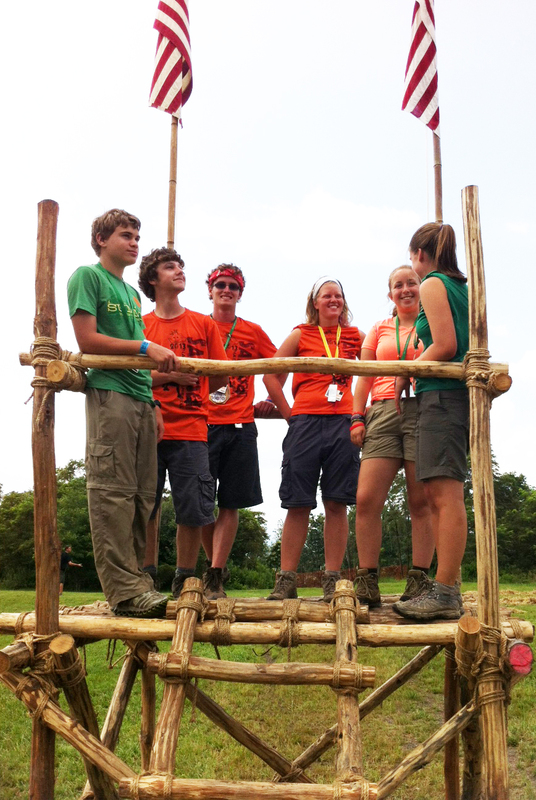 Building and hoisting these towers affords a rich experience in Scout engineering. Across from these displays, on the other side of Peschke FIeld, were two towers designed and presented just for climbing. 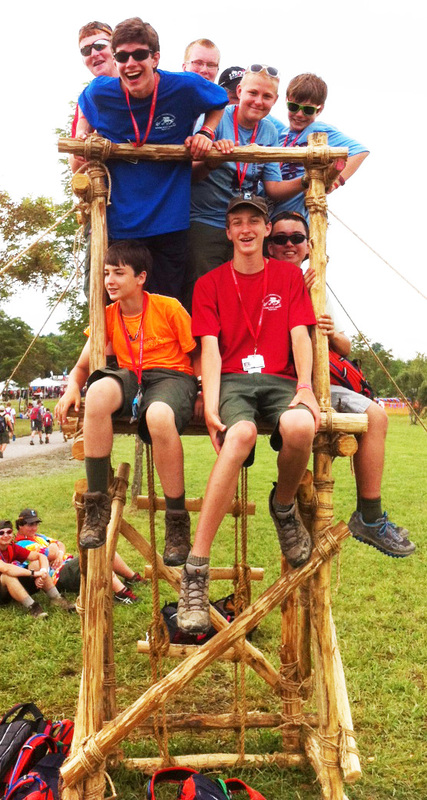 Some find it frustrating to adhere to the present BSA height restrictions, however, Scouts and Venturers still had fun on these lower structures. Plainly stated, a wide range of pioneering experience and enjoyment has always stemmed from and revolved around a variety of projects that are close to the ground. 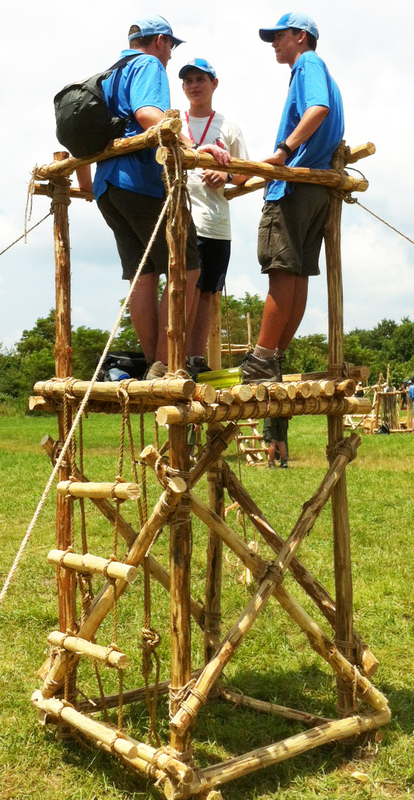 Two small pioneering crews were directed to build traditional square towers that Scouts and Venturers could climb on. 1) 4′ x 4′ Square Tower with a platform 5-1/2′ high. One group chose 8-foot spars for the legs, 4-foot spars for ledgers, transoms, spreaders, floor slats and handrails, and 5-foot spars for the X-braces and diagonal supports. (See Photo Diagram 1 and click on the image for a larger view.) In essence, the little tower was simply two trestles with a top handrail connected on each side by three spreaders. 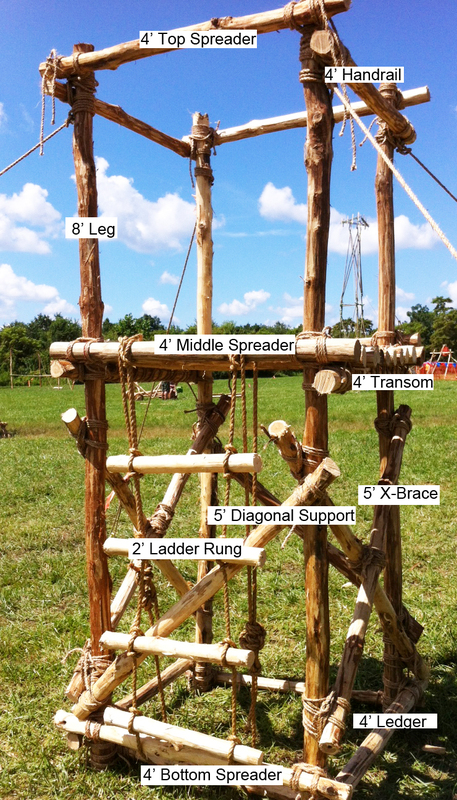 For easy access on and off, a rope ladder was tied to a middle spreader. 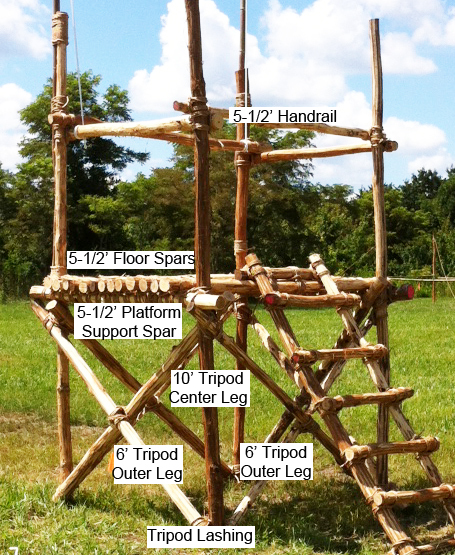 Finally, the finished tower was guyed down from the top of each leg. The completed structure was very sturdy. During the entire jamboree, it saw plenty of action and needed only a minimum of tightening. When completed, the tower stood so squarely, and was so aesthetic-looking, the director decided to add a couple of flags which were lashed to the two rear legs. The 5-1/2′ floor slats were each square lashed onto the platform support spars, which also contributed to the soundness of the overall structure. A simple ladder rung stairway was added for easy access.